OBJECTIVE Meat intake has been consistently shown to be positively associated with incident type 2 diabetes. Part of that association may be mediated by body iron status, which is influenced by genetic factors. We aimed to test for interactions of genetic and dietary factors influencing body iron status in relation to the risk of incident type 2 diabetes. RESEARCH DESIGN AND METHODS The case-cohort comprised 9,347 case subjects and 12,301 subcohort participants from eight European countries. Single nucleotide polymorphisms (SNPs) were selected from genome-wide association studies on iron status biomarkers and candidate gene studies. A ferritin-related gene score was constructed. Multiplicative and additive interactions of heme iron and SNPs as well as the gene score were evaluated using Cox proportional hazards regression. RESULTS Higher heme iron intake (per 1 SD) was associated with higher ferritin levels (β = 0.113 [95% CI 0.082; 0.144]), but not with transferrin (−0.019 [−0.043; 0.006]) or transferrin saturation (0.016 [−0.006; 0.037]). Five SNPs located in four genes (rs1799945 [HFE H63D], rs1800562 [HFE C282Y], rs236918 [PCK7], rs744653 [SLC40A1], and rs855791 [TMPRSS6 V736A]) were associated with ferritin. We did not detect an interaction of heme iron and the gene score on the risk of diabetes in the overall study population (Padd = 0.16, Pmult = 0.21) but did detect a trend toward a negative interaction in men (Padd = 0.04, Pmult = 0.03). 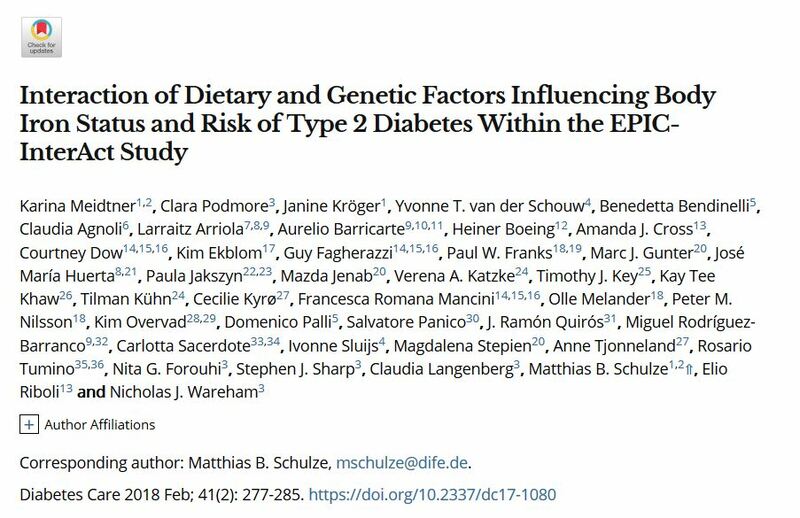 CONCLUSIONS We found no convincing evidence that the interplay of dietary and genetic factors related to body iron status associates with type 2 diabetes risk above the level expected from the sum or product of the two individual exposures.